Theresa has been married for 30 years. She married when she was young and seemingly invincible, thinking she knew what her life was supposed to look like. Her dream included being married to a good man, having a nice home, and most importantly, raising beautiful children who would grow into being amazing adults. Focusing on raising her beautiful boys brought her joy… it also kept her distracted from what had been happening in her marriage for many years. During that time, Theresa’s marriage had withered. They didn’t communicate well and they rarely connected. On their good days, they were decent co-parents and on their bad days, they were more like intolerable roommates. While he worked hard at his job and provided for the family, she felt like she was all alone doing everything else for their family and the boys. Theresa could ignore her loveless marriage while the boys were young. She could numb and distract herself years ago. She could quietly hold out hope that eventually things would magically get better. Distractions have a shelf life. After her boys went off to live their own lives, all the heartache and loneliness that Theresa’s been able to avoid for so many years became present – front and center – in her daily life. She wasn’t sure she still loved her husband, and she certainly didn’t feel love from him. The emptiness in her loveless marriage became inescapable and unavoidable. She could no longer run from it. It was right in her face. She felt stuck, hopeless and afraid. The only answer she did have: staying in this loveless marriage for another 30 years simply wasn’t an option – not for One. More. Day. She knew that after feeling stuck for so long, she couldn’t pull herself out of this darkness on her own. To get her answer for her life, for her heart, and for her family, she reached to me for help and committed to the loving process of finding herself and her happiness again. Theresa and I have only been working together for a short time, but already she doesn’t feel as anxious anymore. She’s starting to be able to rest in not knowing the answer quickly, and accept that taking the steps to unravel the tangled feelings and wounds of her marriage is the only way to find her happy again. She’s beginning to feel more confident that no matter what the outcome, she will be okay. She’s even starting to like the idea of creating a life for herself and who she is now. And she’s softening, she’s dropping the resentments she’s carried for years and starting to see and accept her husband for who he is, rather than who she needed him to be for so long. 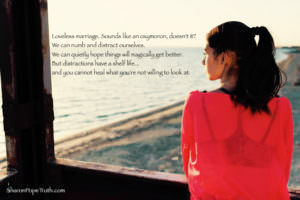 The love in the loveless marriage may be there; or it may not. But she’s taking the necessary steps to figure that out. Working together and opening herself to be guided through a soulful journey with me, Theresa will have her answers for her life. She will know how to navigate the uncharted waters of what will come next for her. Her life will look and feel different at the end of our work together, because she will be different. And whether she stays and re-connects with her husband or lovingly releases the marriage, my role as her coach is to guide her back home to her heart. If you’re on the fence about whether now is the time to get your answers and aren’t yet ready to explore working together, check out my extensive library of #1 international best-selling books – all available on Amazon.